CI can help you find the right cloud solution model to fit your requirements. No two businesses use cloud services the same way. That's why CI offers several customizable cloud models. Choose from virtual public or private deployment, high availability or software as a service options, then customize with flexible configurations, features and support. Set up multiple cloud spaces and manage them effortlessly from our customer portal. Our comprehensive solutions enable you to make the best choice to fit your business demands, when and where you need them, while keeping costs within budget. Virtual public, private, high availability and SaaS options. Focused, integrated approach to hybrid cloud deployments. Managed services for critical applications and processes. Reliable performance and global connectivity. A Private Cloud deployment option is a Client Premise to Cloud model. Typically in this model the calling traffic still comes on premise but is forwarded to the Cloud where resident applications process requests or provide self-service access for inbound traffic. A Public Cloud deployment option is telephony directly to the Cloud. This option is a cost effective efficient alternative to an on premise solution. It is particularly well suited when there is a need to replace a legacy IVR/telephony platform. Software as a Service (SaaS) is a licensing and delivery model in which software is licensed on a subscription basis and is centrally hosted. SaaS gives customers the option to "rent" the application and use HA (High Availability) as the cloud deployment option and delivery mechanism. The Consumption Cloud deployment option is a model that is seasonal, transactional and usage based. Typically this will be a short term arrangement for a full time activity. What separates this from other options is the way it is billed. 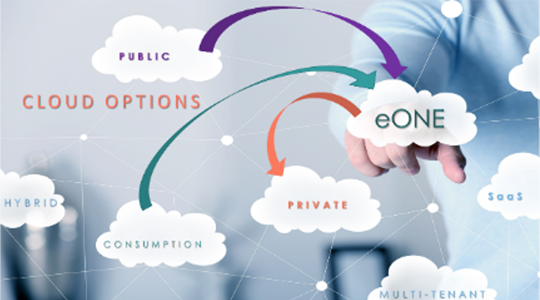 Is the cloud option that gives a single host the ability to provide eONE's IVR Platform access to separate entities (Tenants) who wish to maintain their identities as individual companies, institutions or facilitates. Tenants maintain their own applications, call flows and all aspects of the application in use just as though they had a dedicated cloud solution of their own. Contact CI today to learn how e-IVR can help you Improve Customer Satisfaction, Lower Development Costs, and Reduce Time to Delivery.